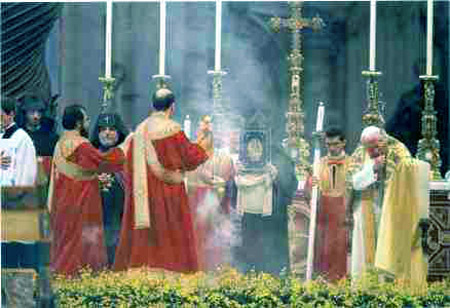 Above, John Paul II, together with the Monophysite Armenian patriarch Karekin II, fourth from left, preside at an liturgical ceremony at St. Peter's Basilica. The Canon Law of 1917 severely condemned persons who promote this kind of ceremony - communicatio in sacris - as suspect of heresy (Canons 1258, 2259, 2261, 2315, 2316, 2338, par. 3). 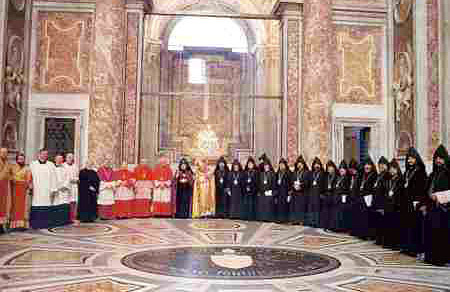 Below, the sinister presence of those same heretic bishops at the Vatican. One can distinguish JPII in the center in gold.